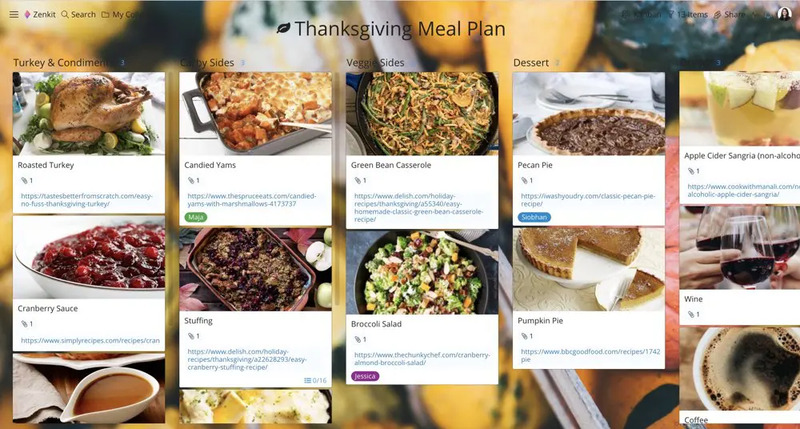 Plan and prep the perfect Thanksgiving Feast with Zenkit! Hosting the perfect Thanksgiving dinner is a monumental task, and if you don’t have a few miracles up your sleeves, then you’ll have to make do with a bunch of planning and preparation. And being the planning aficionados that we are, in this article, I’ll show you how it can all get done with Zenkit by your side. 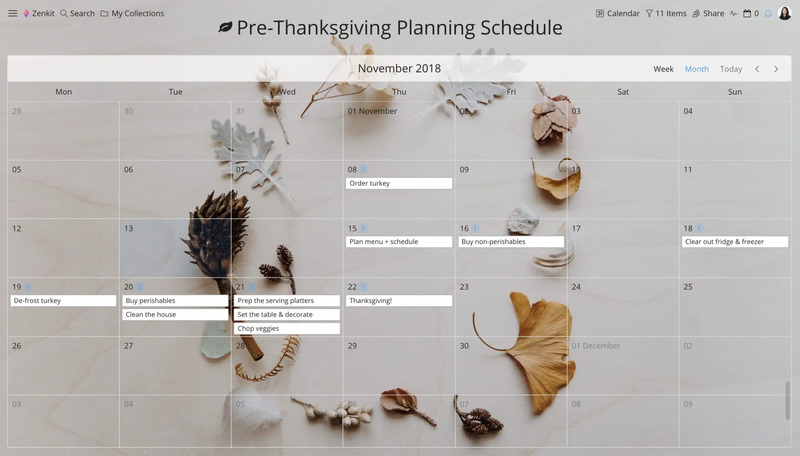 As you all know, our project management tool is not only great for managing team projects and day-to-day business operations, but it’s also superb for meal planning. The visual aspect of the different views on offer makes it ideal for organizing recipes and putting together shopping lists. And since the food is Thanksgiving’s main attraction, it makes sense to coordinate it all with Zenkit. Here’s how you can do it. Your first step is to create a game plan that includes all the tasks you need to do before the big day. Getting as much done as possible prior will not only alleviate stress on the day, but it will also enable you to actually spend time with family and friends instead of being stuck in the kitchen. The perks of planning include being able to make well-informed decisions and preventing unwanted predicaments from happening. For example, the last thing you want to happen is to show up to the grocery store the night before only to find out that they’ve run out of cranberries. And what is Thanksgiving without cranberries? Planning ahead will allow you to come up with a list of backup stores so that you don’t miss out on any ingredients. Having a calendar schedule will allow you to visualize the days you planned out. It can also serve as a countdown, notifying you on what things are left to do as you get nearer to the day. Zenkit’s My Calendar feature is great for this. Not only can you customize it to your liking, but it can also be integrated with familiar apps such as Google Calendar so that you can sync it with your regular tasks and appointments. Because Thanksgiving is a holiday full of traditions, you won’t have to do much recipe researching as you’ll already have an idea on the kind of dishes you are going to serve. My recommendation is to stick to the classics—especially if this is your first time hosting—and the recipes that have been tried and tested. Save the experimentation for another dinner party. Every menu will slightly differ depending on family and regional recipes. However, traditionally speaking, it will generally consist of the turkey as the pièce de résistance, a few favorite sides, and pie for dessert. Once you have your guest list numbers and dietary requirements confirmed, it’s time to plan your menu. 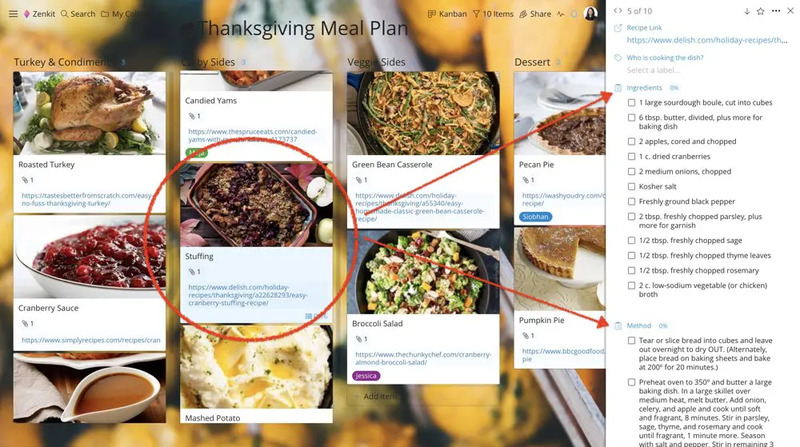 The most practical way to manage your recipes and plan the big meal is to use Zenkit’s Kanban view. This feature will allow you to visualize which dishes are served when, and give you easy access to the recipes. The beauty of using Zenkit is that you get to take advantage of its Custom Fields. These are features that add a new level of function, formality, and context to your tasks which range from text to labels to checklists. For instance, when putting together the recipes for your menu, you can add information that highlights who is responsible for making which dish, as well as outline the ingredients and method. A great hack is to delegate a few dishes to some family and friends. Just because you’re hosting, there’s no rule that states you can’t ask for a bit of help. Besides, most people would be more than happy to contribute to the dinner. Don’t forget your shopping list! No matter how photographic your memory might be, when it comes to shopping for Thanksgiving dinner, you’re bound to forget something. As this is definitely not the time to be doing that, creating a shopping list is a must. A common approach is to create two shopping lists, one for a list of non-perishable items that you can buy days in advanced and then a list of perishable items which you purchase a day or so before Thanksgiving. 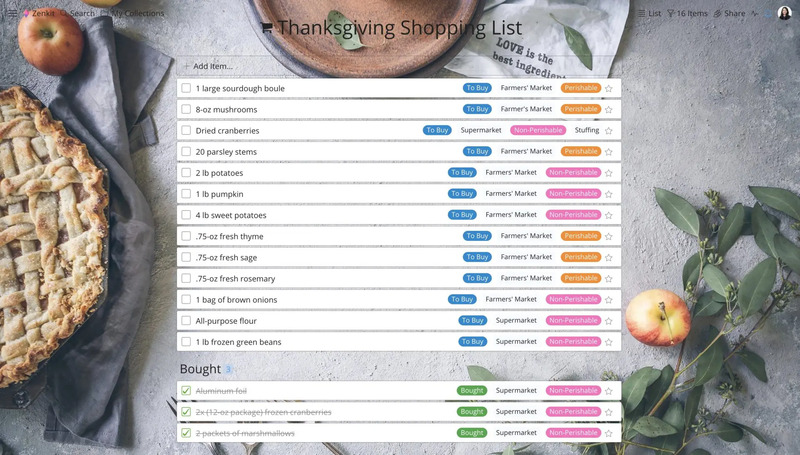 When creating your shopping list with Zenkit’s list view, you can use the Custom Field label feature to categorize your grocery items which saves you from having to create two lists. Custom Fields can also be used to identify where each item can be purchased and which dish they belong to. The best thing about using this task list feature is that once you tick an item off your list, the list rearranges itself so that the items that require action are shifted to the top. Check that you have all the necessary equipment such as a thermometer, carving knives, and serving platters. If you fall short, ask your family and friends if you can borrow theirs before you go spending more money. Before serving up the food, label each dish and utensil with the food they will be used for. This will help to ensure that you have a place for everything. Be conscious of your kitchen space. If you have a small oven, opt for side dishes that you can either make on a stovetop or in advance and then reheat just before the meal. When figuring out when to start defrosting your turkey, don’t forget that for every four pounds, you need a day’s worth of thawing. Also don’t forget to add an extra day if you’re going to brine it. While not every dish is doable days in advance, you can still prep for those that aren’t by peeling and chopping up the vegetables, and making broths and marinades the night before. Despite having a foolproof plan-of-attack in place, just remember that things can still go wrong. C’est la vie. Try not to stress about it too much and keep in mind that the purpose of Thanksgiving is to spend time with loved ones and appreciate what you have. Your guests will be thankful for the effort you’ve gone through and so what difference does it really make if the gravy is served out of a beer stein instead of a gravy boat?